I might as well come clean right from the start. Prepare yourselves for the bold, unadulterated, glaringly bright, spill-coffee-all-over-your-shirt truth: I have been withholding, people. It hasn’t felt good, but it hasn’t felt that bad either, I have to confess. I have held off writing about one of the most famous events in Thailand, and a part of me was hoping to quietly withhold for another year at least, whilst you shrugged and theatrically turned your back on me, switched off your bedside light with a forlorn sigh whilst I pretended not to care at all. But the thing is, I do care, even though I pretend I don’t. Even though I feign intense interest in my book as you noisily go about the business of feeling rejected, inside I have been burning with the desire to fire a rush of adjectives at you before sleep takes a hold. 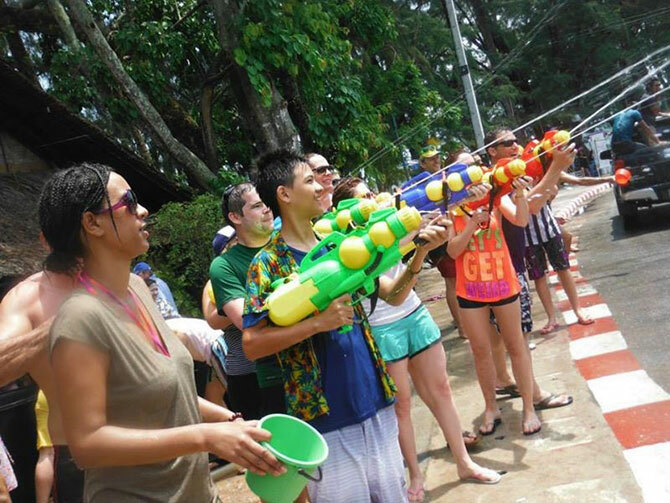 Adjectives dripping with intent, adjectives soaked in the peculiar magic of Songkran day. My adjectives would have you booking a ticket to Phuket or Chiang Mai before I had even finished talking, before I even had time to consider how rude it was when people look at their phones when you are talking to them, especially when you are transporting them to a magical place with a few well-clustered syllables. Maybe now I should roll over and turn off my bedside light in disgust, and leave you to a bunch of empty pages loaded with that silence only married people know about. So, here we are, arrived kicking and screaming like the school bully having a bad day, at the Songkran piece. Welcome. 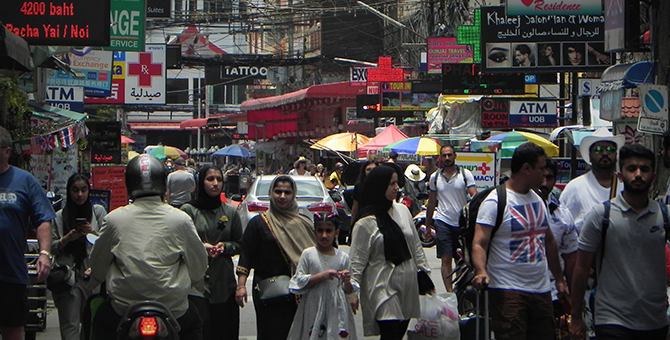 For those tapping their noses or nodding through a smirk, having had the pleasure of a Songkran experience, or even those picking their noses distractedly and just killing time before they can go to lunch, please feel free to skip this next bit. The Songkran Festival, the traditional Thai New Year, is a time when family and friends gather to pay gratitude to elders and visit temples for prayer and offering. 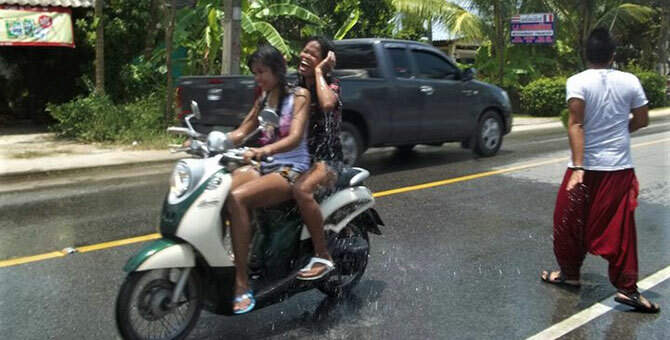 Songkran literally means ‘to move or to pass into’: transformation. What better way to greet this than by literally washing the old year away, into a waiting stormwater drain not too badly choked by plastic? The time is characterised by feelings of goodwill, love, compassion and thankfulness, not to mention a lot of public drunkenness. Water, as it turns out, is the means of expression and the intention is to wash away the past year, and greet the new year soaked from head to toe wearing the happiest, if not slightly drunken, of grins. To the thousands that fly here from their own countries, Songkran is the biggest, most friendly water fight you will find anywhere on this earth. Songkran is your face smeared with flour and water making your clothes look like your older brother’s hand me downs. It is a million water guns, like the Supersoaker 5000, searching out your eyeballs or nostrils and firing icy blasts in your direction, in every direction. Songkran is Thai pop music with a heavy, liquid bassline pumping out of car speakers whilst prancing boys squirt water in the faces of dancing girls and hope to get close enough to smear some flour over their faces. Songkran is the famous Thai smile mutated into a hysterically happy grin and worn on all the faces you will see. 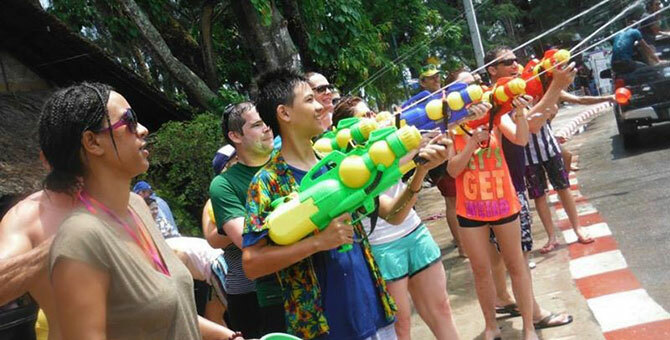 Songkran is the fast eye contact of attraction, it is the corners of the mouth twisting upwards as a pick-up truck full of drunken, smiling young men with their shirts off, grinning like Cheshire cats, rides past and soaks you yet again. It is in the feigned upset frown of a drenched young woman that turns into a momentary flash of desire, a flash so intense a man could live his life basking in its glow. Songkran is the sound of laughter and shrieks of delight permeating the sodden air around you, it is the infectious rhythm of sixty eight million people feeling free for a day. And it is probably the best fun you could ever have. The best Songkran is always your first one. Your lungs and jaw will be sore from laughing so much, your beer will miraculously disappear in a few gulps and your face will ache from constant grinning. There is a high chance you will have drained four beers before midday and will be looking for some Thai whisky to keep the vibe going. You will have lost your friends somewhere in the deluge and will have met some new ones. Language issues will have disappeared and you will be happily conversing via grunts and groans of pleasure, riding the mutual high. You will have stood there amazed at the thinly veiled, simmering sexual energy expressing itself through the conduit of water: buckets of it, handfuls of it, guns full of it as girls shriek and steal a quick glance, as guys high five each other and feign indifference. The dance goes on all day, exhausting itself eventually as a sodden sun slinks out of the sky and a night of bleary eyed euphoria awaits. 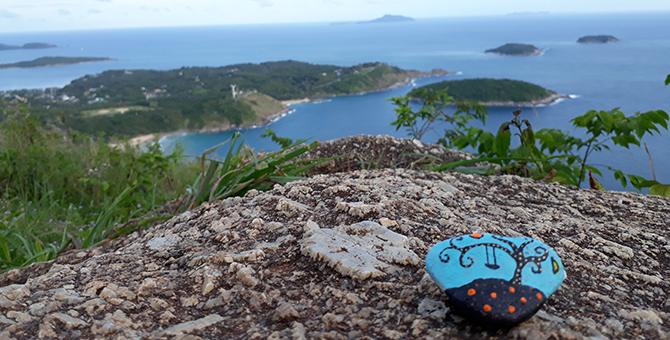 It is on these days that, if you are lucky, a happy little insight or two will float by. You will try to get a hold of them but your hand will be wet and slippery. It’s okay, just let them go and wait for the next pick-up truck full of revellers to punctuate your crazy, bemused grin. In a culture that does not encourage demonstrative shows of affection, or public moments of intimacy, a culture that is actually pretty shy when it comes to all of that sort of stuff, this day stands out not only as a crucial pressure release, but as a day that could not be replicated in any other culture. If Songkran happened in Australia, it wouldn’t be long before the water play turned into an all-in brawl, or some misogynist prick decided to take the flirtatious stuff a little too far. Other foreigners I have spoken to concur that it would be near impossible for this to work in their culture either. Are we just too uptight, or not repressed enough? Who knows? As for me, I’ll leave that stuff to the culture-philes out there and get back to throwing water at people and laughing like there’s no tomorrow.